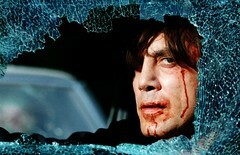 The COEN BROTHERS adapted Cormac McCarthy’s novel into this film of the same name, After writing No Country in 2005, the 75 year old McCarthy has won a Pulitzer Prize for his novel “The Road” in 2006, once again exploring his familiar themes of extreme isolation, perversity, and violence to represent normal human experience. The novel’s motifs of chance, free-will, and predestination are familiar territory for the Coen brothers, and the film subsequently won the Academy Award for Best Picture in early 2008. With so many prizes surrounding these themes and creators, it is fascinating to explore why these works have had such an unstoppable impact on our culture. Violence and mayhem ensue after a hunter stumbles upon some dead bodies, a stash of heroin and more than $2 million in cash near the Rio Grande. No Country For Old Men, the 2008 Oscar winner for Best Picture (and in three other categories) stumbled upon the Wedgwood Campus for our live, monthly Cinemagogue event. I’ve been a big fan of the Coen brothers since Raising Arizona and have enjoyed their work from Miller’s Crossing to The Hudsucker Proxy. For some reason, I’d missed The Big Lebowski until last year and finally enjoyed Jeff Bridges amazing performance. (Did anyone notice Jeff’s tip of the hat to Lebowski in his latest film, Iron Man?) Still, I wasn’t immediately enraptured with this film as most were last year. A few friends of mine loathed it. After contemplation, repeat viewing, and some study, it’s actually quite illuminating to me why this film has struck a chord in both film buff and casual viewer and I’ve come to a profound appreciation for what the film has to offer. Great Insight. I had the same feelings you had except I probably liked it a little more after the first time seeing it.